The latest analysis from the Department of Health and Human Services (HHS) shows that more than 16.4 million Americans have acquired health coverage under the Affordable Care Act. The report issued Monday was based in part on findings from a Gallup poll, which found the uninsured rate for Americans had fallen from 20.3 percent in October 2013 – when the sign-ups began – to 12.3 percent during the first quarter of 2015. The increases come from sign-ups through the Affordable Care Act’s health insurance exchanges and the expansion of Medicaid. “Since the passage of the Affordable Care Act (ACA) almost five years ago, about 16.4 million uninsured people have gained health coverage – the largest reduction in the uninsured in four decades,” HHS Secretary Sylvia Mathews Burwell said in a written statement accompanying a new report. The increase of insured Americans represents a 35 percent reduction in the number of uninsured, leaving 26 million American adults without health insurance compared to the previous number of approximately 40 million. The greatest changes in coverage gains were among Latinos and African-Americans, according to a Gallup-Healthways Well-Being index survey. 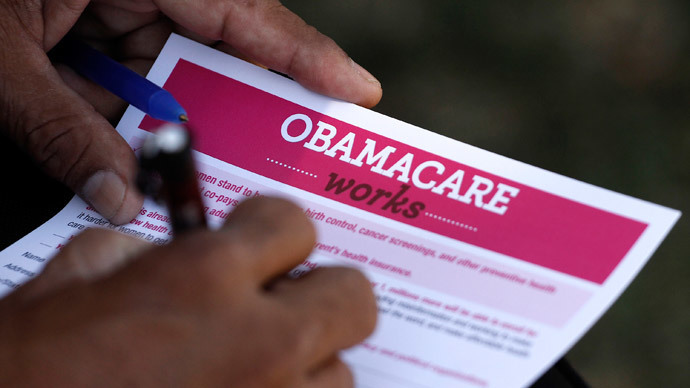 For Latinos, the uninsured rate was 41.8 percent before Obamacare was launched. By the first quarter of 2015, that number dropped by just over 12 percent, leaving 29.5 million without insurance. For African-Americans, 22.4 percent were without insurance by the first quarter in 2014. That percentage was almost cut in half by the first quarter of 2015, leaving 13.2 percent of African-Americans without health insurance. Wow. 16.4 million Americans have been insured under Obamacare http://t.co/brlXLJfdb0. Largest drop in uninsured in 4 decades. White Americans, meanwhile, saw a 5.3 percentage point reduction in their uninsured rate. Just 9 percent remain without health coverage. The overall decline comes from government-run marketplaces that sell health insurance, the loosening of Medicaid eligibility requirements in more than half the country and allowing young adults to stay on their parents’ health plans until they turn 26. “When it comes to the metrics of affordability, access and quality, the evidence shows that the Affordable Care Act is working, and families, businesses and taxpayers are better off as a result,” said Burwell. There are 28 states and Washington, DC that have expanded their Medicaid programs, and another 22 states kept their stricter restrictions on Medicaid eligibility. The goal of Obamacare was to reduce the number of uninsured Americans and the latest figures suggest growing progress towards the goal, but this achievement could be threatened by a lawsuit being heard by the US Supreme Court. The lawsuit, King v. Burwell, centers on whether federal subsidies in 34 states that have not set up their own health insurance markets (“exchanges”) are legal under the law.